WHAT IS THE SBI TEST? 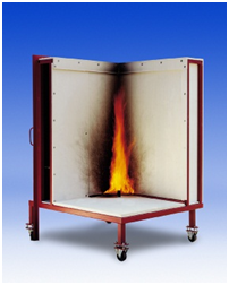 The Single Burning Item (SBI), is a method of test for determining the reaction to fire behaviour of building products (excluding floorings) when exposed to the thermal attack by a single burning item (a sand-box burner supplied with propane). The specimen is mounted on a trolley that is positioned in a frame beneath an exhaust system. 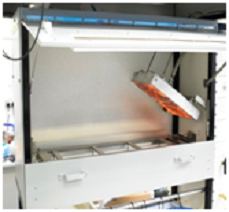 The reaction of the specimen to the burner is monitored instrumentally and visually. Heat and smoke release rates are measured instrumentally and physical characteristics are assessed by observation . WHY IS THE SBI SO IMPORTANT? Most construction products sold in Europe will shortly need to be tested and classified using a new test method called the Single Burning Item (the SBI) EN 13823. The construction products directive of the European commission will require that all European Member states eventually use this, instead of the traditional regulatory methods used in each country, to classify most building products. The Commission recently defined the criteria for assessing building products into classes A-F. These are given in the table below. Though other test methods are required the SBI is needed to classify all non flooring products into the classes A2, B, C and D which are the major classes inhabited by most products other than those that are principally inorganic classified as non-combustible . HOW IS THE SBI USED TO CLASSIFY COMBUSTION PRODUCTS? •	over temperature device . Manufactured from steel with a polished finish. This single zone furnace has a maximum operating temperature of 900°C. The furnace is easily replaceable during maintenance and servicing procedures. A 19" instrument case houses all the instrumentation. This unit features a temperature controller, an over-temperature alarm and a power controller, which controls the furnace temperature at 750°C, compensating for supply voltage fluctuations and displaying the power (Watts) being supplied to the furnace. The software is a Microsoft Windows based application with simple push button actions, data entry fields, check boxes and other standard Windows operations. The operator can monitor temperatures on a Status panel, before performing a test, without recording any data. Before a test, the specimen information (material name, density, mass, laboratory name, etc.) is entered into the computer and saved to a file. During a test, the temperature of the furnace, specimen surface and specimen centre thermocouples are recorded at a rate of 2 Hz (i.e. every 0.5 seconds) and the temperatures displayed on a graph in real time. Also the initial, maximum and final temperatures recorded by the three thermocouples are displayed during the test run. The test report shows the material information, the initial, maximum and final temperatures, the required temperature rises, the total flaming time, the mass loss (actual and as a percentage of the initial mass) and a graph of the recorded temperatures against time. The test report also includes a reference to the pass-fail criteria given in the appropriate Standards and states whether the specimen meets these criteria. All the test data is saved to the hard disk as an ASCII file which can then be imported into spreadsheets for additional analysis . This test method is used to measure the critical radiant flux of horizontally-mounted floor covering systems exposed to a flaming ignition source in a graded radiant heat environment, within a test chamber. It can also be used to measure this same critical radiant flux for exposed attic floor cellulose insulation. The European Union is using this test method for fire classificaiton of flooring products, throughout European Member States. The radiant heat is applied by means of a gas-fuelled panel, inclined at 30º, and directed at a horizontally mounted floor covering system specimen. The radiant panel generates a radiant energy flux distribution ranging from a nominal maximum of 10.9 kW/m2 to a minimum of 1.1 kW/m2. A small stainless steel pilot burner assists in specimen ignition. The distance burned until flame-out is reached and converted, by calibration, into an equivalent critical radiant flux, in kW/m2. 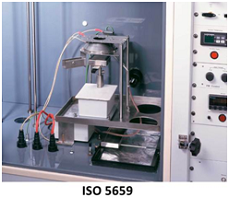 A smoke measuring system, according to DIN 50055, is mounted on a separate frame at the exhaust stack. Traditionally, tests are conducted to give a maximum critical radiant heat flux of 10.9 kW/m2, but it can optionally be conducted with higher radiant heat input, of up to 25.0 kW/m2. Angled Control Rack for convenience in use, allowing observation of the apparatus and controls duing equipment set-up and calibration. Automatic ignition of the radiant panel and safety cut-out. Hinged access to test area, via 2 position door with observation window and sliding platform. Stainless steel hood with smoke measurement ports. Data acquisition and analysis software. 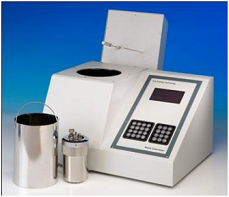 The FTT EN ISO 1716 Bomb Calorimeter is an affordable high resolution isoperibolic temperature regulated oxygen bomb calorimeter with embedded control computer. 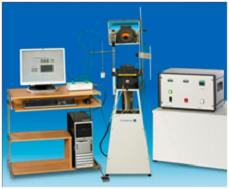 The bomb calorimeter is the most common device for measuring the heat of combustion or calorific value of a material. With this apparatus a test specimen of specified mass is burned under standardised conditions. The heat of combustion determined under these conditions is calculated on the basis of the observed temperature rise while taking account of heat loss. The combustion process is initiated inside an atmosphere of oxygen in a constant volume container, the bomb, which is a vessel built to withstand high pressures. It is immersed in a stirred water bath, and the whole device is the calorimeter vessel. The calorimeter vessel is also immersed in an outer water bath. The water temperature in the calorimeter vessel and that of the outer bath are both monitored. An isoperibolic bomb calorimeter is a calorimeter where the jacket temperature is kept at a constant temperature while the calorimeter vessel (bomb and bucket) temperature rises as heat is released by the combustion of a sample. The jacket and bucket temperatures are continuously measured enabling the heat loss to be corrected for after the test. An embedded control computer, keypad and LCD enables instrument automation, data acquisition and analysis via user friendly menu driven software. The embedded control computer automatically sets the outer bath temperature. The temperature is measured using two high precision, high resolution platinum resistance thermometers (PRTs). 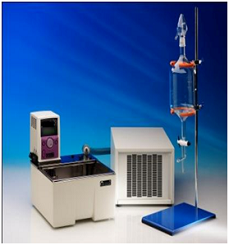 An external thermostatic controller, bath, circulator and cooler is supplied as standard together with a pipette for temperature controlled filling of the calorimeter vessel. This removes human error increasing repeatability and significantly reduces the preparation time between tests. 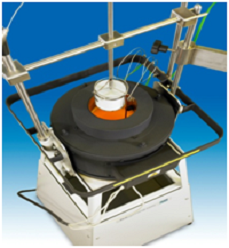 To simplify instrument operation the FTT Bomb Calorimeter is fitted with a semi-automatic filling system. The user merely connects the push on coupling and presses the key to fill the bomb with oxygen. The bomb then fills to the desired pressure and automatically switches off. If this pressure is not reached an error message is shown. The embedded computer controls the temperature of the outer bath and shows when the calorimeter vessel temperature has stabilised. At this point the bomb is automatically fired. The FTT bomb calorimeter is calibrated by burning certified benzoic acid to determine a constant called the ‘water equivalent’. The instrument can record the water equivalent for several bomb/bucket combinations. For each bomb/bucket combination five calibrations are performed. The software calculates the average of these five calibrations and uses this value as the water equivalent when testing a sample. Bomb calorimeter with embedded computer control, user-friendly interface, LCD graphics display, high accuracy / resolution PRTs, 2 x RS232 interfaces, parallel port for printer. The Oxygen Index is, perhaps, the most economical and precise quality control test of combustible materials. Its ease of use together with high levels of precision has made this technique a primary characterising and quality control tool to the plastic and electric cable industries and it has been specified by several military and transport groups. The technique measures the minimum percentage of oxygen in the test atmosphere that is required to marginally support combustion. Note that BS ISO 4589 supersedes BS 2782 Part 141. The FTT unit has been designed to be compact for efficient use in a standard fume cupboard (or under a simple ventilation hood that we can also supply if required). The unit gives continuous digital readout of oxygen concentrations in the test atmosphere to facilitate quick settings of test concentration. Stabilised oxygen percentages are read from the digital readout and no additional flow adjustments are required. This is a considerable improvement over systems that use analogue gauges or require flow matching and the use of graphs or tables to calculate oxygen concentrations. This makes the unit as automatic as is feasible. 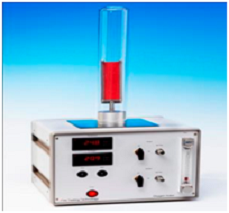 The Oxygen Index can be used in conjunction with the Elevated Temperature Oxygen Index apparatus (TOI) to determine the oxygen index at temperatures up to 125°C. New Paramagnetic Oxygen Cell for assessing accurate oxygen (< 0.1%) levels. 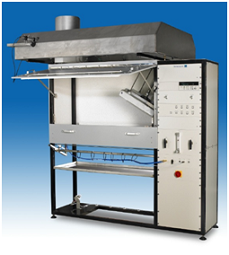 Compact unit for efficient use inside a laboratory hood, with ventilation. Quick loading of test specimen into test chimney measuring 450 mm × 75 mm. Horizontal Burning Test; UL 94HB (ASTM D 635, IEC 60695-11-10, IEC 60707, ISO 1210). Vertical Burning Test: UL 94 V-0, V-1, or V-2 (ASTM D 3801, IEC 60695-11-10, IEC 60707, ISO 1210). 500 W (125mm) Vertical Burning Test: 5VA or 5VB (ASTM D 5048, IEC 60695-11-20, IEC 60707, ISO 9772). Thin Material Vertical Burning Test: VTM-0, VTM-1, or VTM-2 (ASTM D 4804, ISO 9773). Horizontal Burning Foamed Material Test: HF- 1, HF-2 or HBF (ASTM D 4986, ISO 9772). 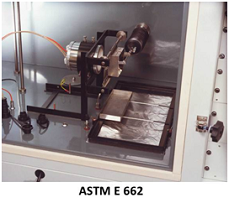 Burner calibration kit, conforming to ASTM D 5207. 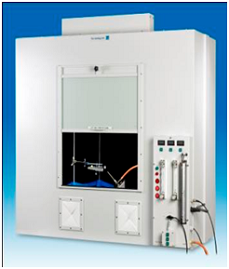 Test chamber with full width opening door, allowing easy access for sample loading and chamber cleaning. Controls are mounted beside chamber for convenient operation. They are not obstructed when door is open. Smoke density and temperature are on digital displays, for easier use and greater accuracy. Chamber walls are pre-heated for easier start-up and convenient equipment operation. Safety blow-out panel, easily replaceable, allows for safe operation of test method. Gas measurement ports are provided, for optional measurements of toxic gases. Cabinet designed with a standard 19" rack, for simple addition of gas analysers and chart recorder and other control units. 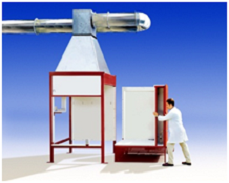 The FTT Cone Calorimeter has been produced to meet all existing Standards (including ISO 5660, ASTM E 1354, ASTM E 1474, ASTM E 1740, ASTM F 1550, ASTM D 6113, NFPA 264, CAN ULC 135 and BS 476 Part 15) and can also be purchased in modular form so that those laboratories with particular interests such as heat release, mass loss, smoke production, etc. can initially purchase the sections they require and later add further instrumentation into the same cabinets in order to complete a full specification instrument. This is just one of the advantages of the FTT Cone Calorimeter. Conical Heater - is wound in the form of a truncated cone, rated 5000 W at 230 V with a heat output of 100 kW/m2. Temperature control by the use of a 3 type K thermocouples and a 3-term (PID) temperature controller. A Split Shutter Mechanism - protects the sample area before the test. This ensures the initial mass measurement is stable and the operator has additional time for system checks before starting the test. This added time is very important for easily-ignitable samples, which often ignite prematurely if a shutter mechanism is not used. Specimen Holders - for specimens 100mm x 100mm up to 50mm thick, in the horizontal and vertical orientation. Load Cell - mass measurements are conducted via a strain gauge load cell with an accuracy of 0.01g. Fitted with a quick electronic tare facility and mechanical stops to avoid movement damage, give stable results and long life. Spark Ignition - by 10 kV spark generator fitted with a safety cut-out device. The igniter is automatically positioned by a lever linked with the shutter mechanism. Exhaust System - manufactured from stainless steel for long life. This comprises, hood, gas sampling ring probe, exhaust fan (with adjustable flow controls from 0-50g/s, at a resolution of at least 0.1g/s) and an orifice plate flow measurement (thermocouple and differential pressure transducer). Normal operation is at a nominal 24 l/s. Gas Sampling - comprising particulate filters, refrigerated cold trap, pump, drying columns and flow control. Oxygen Analysis - paramagnetic oxygen analyser, which has a range of 0-25% and a performance compliant with the standards. Smoke Obscuration - measured with a laser system, using photodiodes, and a 0.5 mW Helium Neon laser, with main and reference (compensating) photo detectors. Supplied with alignment cradle and 0.3, 0.8 neutral density filters for calibration. Heat Flux Meter - for setting the irradiance level at the surface of the specimens. 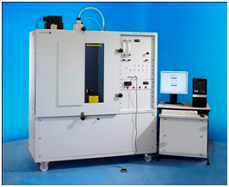 Calibration Burner - to calibrate the rate of heat release measured by the apparatus using methane of 99.5% purity. Data Acquisition – Agilent Data Acquisition / Switch Unit featuring a 3-slot cardcage with 6½ digit (22 bit) internal DMM enabling up to 120 single-ended or 48 double-ended measurements. Scan rates up to 250 channels/s are available with a 115kbaud RS232 and PCI GPIB interface as standard. All readings are automatically time stamped and can be stored in a non-volatile 50,000-reading memory.